By hardship, Wally and Erna learned to take good care of what they have and whom they love. A beneficiary of their kindness, I hereby thank my Good Samaritans. When I wrecked my hedge trimmer in the midst of pruning a lavender field, Erna said, “Wally can repair this.” Those Black & Decker blades still hum away. And well they should, for Wally is a master machinist by vocation. His heart is in his hands. Nothing goes broken within Wally’s household. Soft-spoken and hard working, Erna is her husband’s domestic equal. Believe me, no dust gathers under her feet. Be it hoeing beans or stitching a quilt, Erna sings her German folk songs with a smile on her face. No matter my effort, I fail to master one verse. Theirs is a remarkable romance I’ve pieced together through the years. Wally Hermann was born in Wohlinia, a German town in Ukraine within White Russia. Several years later, Erna Weiss let her first cry in Maniersch, a German village in Romania. Both families were vintners and farmers by heritage. When Russian soldiers invaded Ukraine, Wally’s father made Vodka for them and saved his life. He later found a route to Germany and led his family to freedom in America. Meanwhile, Russian troops marched into Romania, seized the land of Erna’s birth and placed guards in their vineyards. Erna’s parents trusted God to guide them to freedom. They were amongst the first to leave their homeland during the war. Miraculously, their family escaped Romania into America with her father’s Warren hoe. A treasured possession, Erna carries this heart-shaped blade into her gardens. My soil also knows the smooth, rhythmical tilling of Erna’s hoe. Last summer, Erna called upon Wally to remove an ash stump from our property. I stood by helplessly while Erna whacked her shovel at the tree’s roots. Tall and lean, Wally swung his ax. At last he severed the taproot with his Sawzall. Dear Reader, I considered how to return their tender mercies because Erna and Wally accept no paybacks. I offered some grapes from my arbor, but Erna had juice frozen from my crop last year. She did, however, accept lavender plants from my field to transplant into her flowerbeds. 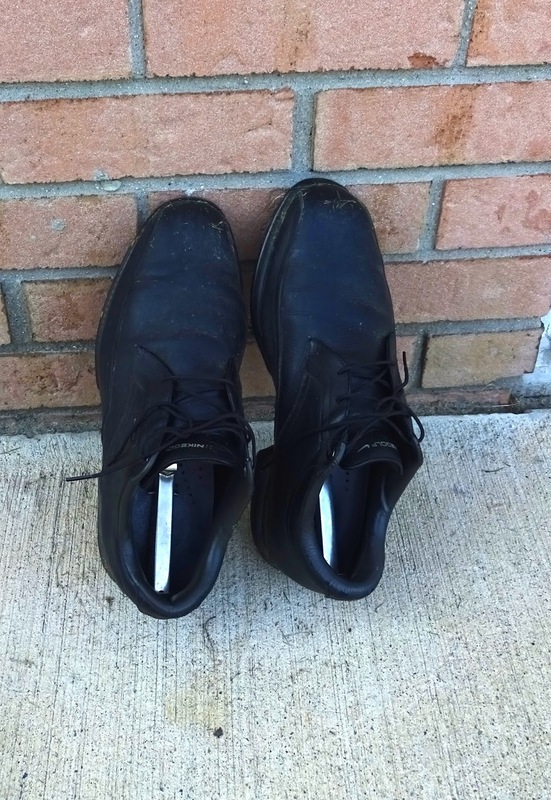 When I drove into their driveway, I saw shoes sunning against the garage wall. “Wally went golfing this morning,” Erna said. Home from fetching apples to make applesauce, he pulled his car next to mine. Oh! I praise the blessed footprint he’s left on my land.